Cut the okra into two inch long pieces. Chop the onion, green chillies (lengthwise) and tomatoes. 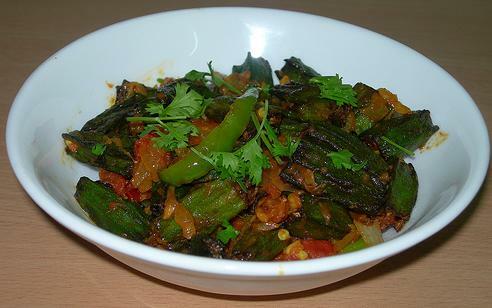 Heat the oil in a kadai and when it is hot, add okra pieces in batches and deep fry till crisp. Remove it and keep aside. In another kadai put 4 teaspoon of oil and when it is hot add cinnamon stick, cloves and bay leaf. Add onion and fry till it become light brown. Add ginger garlic paste and green chillies and fry for a while. Add garam masala and fry for two minutes. Add tomato pieces, red chilli powder, turmeric powder and salt. Mix well and stir fry till the tomatoes are mashed well and blends with the masala. Now add fried okra and mix gently so that the okras will not break. Keep it low flame for two minutes. Remove it and garnish with coriander leaves. This will go well with chapati, roti and any other Indian Bread.